This summer, one of our child sponsors, 9 year-old Alannah Bermingham, became famous across the country as the little girl who saved a toddler from drowning. Alannah was on holiday in Austria, sitting on the side of the hotel swimming pool when the incident happened. Another family had just arrived by the pool and while the parents were preoccupied looking for sunbeds, their 2 year-old daughter climbed the slide and slid into the water without anyone seeing. Alannah suddenly saw her at the bottom of the pool and dived into rescue her, even though it meant going right out of her depth. “I go to swimming lessons every Friday so I’m not afraid of the water,” she explained. Thanks to Alannah’s quick reaction, the little girl survived to make a good recovery. Alannah received a reward from the grateful parents and a bravery award from the hotel. 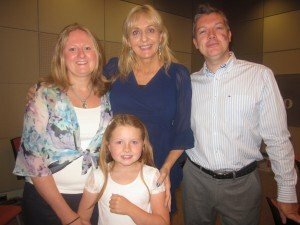 Once home to Dublin, Alannah was thrilled to be invited on to the John Murray show on Radio RTE1 where she was interviewed by Miriam O’Callaghan. Her story was also featured in the Irish Independent and other papers. Alannah says the incident has made her think about becoming a lifeguard when she’s older. She says her mum and dad are very proud of her and we are too. She’s always enjoyed helping others and has been a ChildFund Ireland sponsor for two children for a number of years.